After a couple of really exciting days back-to-back in Asian boxing it's a shame to see the quality drop off, though thankfully March 2nd is one of the weakest days in the month which really is nothing short of packed! Unfortunately after a couple of days with multiple cards we are given just a single one on Sunday though it works as the sort of card to let us have a break between a number of big, action packed, fight filled days. One of the most interesting bouts on this particular show sees the big punching Jenny Boy Buca (6-1, 6) taking on the experienced but very limited Amero Ricablanca (7-41-2, 1). Buca comes in to this bout after having lost his last contest, an 8 round split decision to Jerson Luzarito, though had taken his previous 6 opponents out in a combined 8 rounds. This guy is dangerous and a victory by stoppage really should be expected here and hopefully the loss to Luzarito will have served as a learning experience rather than a disappointing set back. Buca isn't the only big puncher on the show and fellow banger Rege Pahayag (6-1, 5) will look to prove his power is legitimate as he takes on the experienced Richard Betos (20-8-1, 7). Betos is a much better opponent than Ricablanca and like Buca, Pahayag also lost his most recent bout via decision. This will be his hardest test for Pahayag and if he loses it could well be the end for him as a promising prospect. A third puncher on the card is Jeson Umbal (5-1, 5) who fights against Arlon Batingal (7-8, 4) in what is one of the shows better matched contests. As well as the two huge punchers the card does feature some unbeaten men in action. These include Charles Canedo (6-0, 3) and Dexter Alinento (2-0, 1) who face off in a very interesting looking 6 rounder as well as Rimar Metuda (2-0) who we expect to see fight Joel Escol (7-13-3, 4) in a credible enough test for the young Metuda at this point in time. As far as we are aware, they are all the fight on the card. March 1st-Pinoy Pride is back AND we get a Middleweight title unification bout! Boxing through much of January and February has been slow. We know we sound like a broken record with the sheer number of times we've said that but it's true, it has been slow, it's been relatively dull and on the whole it's not had that much to keep us entertained. Worst of all their has been gaps between notable fights and every time we seemed like their was something exciting happening, it ended up not being as exciting as we expected. Thankfully that is set to change in March and and things kick off as they mean to carry on and to begin the month we get two notable cards one in the Philippines and one in Japan. Originally the better card of two in Asia was easily the Filipino card, "Pinoy Pride XXIV: The Future is Now". Unfortunately the card has had to have some alterations this week, though has still remained very interesting, just not the run away "better card" that it was a week ago. The main event here sees the unbeaten Genesis Servania (23-0, 9) defending his WBO Inter-Continental Super Bantamweight title against former WBA Super Flyweight champion Alexander Munoz (36-5, 28). Although Munoz isn't the fighter he once was, he is still a superb puncher and not the type of guy you want to take risks against. If Servania want's to put on a show for the fans he'll have to be very careful. We think he should win but there will certainly be an air of risk going in to this fight. The co-feature was supposed to see the unbeaten Arthur Villanueva (24-0, 14) defending his WBO International Super Flyweight title against Mexican Juan Hernandez (23-3, 16) unfortunately however Hernandez has been forced to pull out after suffering an injury in an auto-mobile accident. Given the short notice it was obvious ALA promotions weren't going to get an equally as good of an opponent on such short notice and that's been shown in the fact Villanueva will now be facing Fernando Aguilar (9-6, 1). The change of opponent hasn't just caused Villanueva to share a ring with an opponent who simply doesn't belong to be in the same fight as him, but has also seen the fight relegated down the card. Instead of Villanueva/Hernandez being the co-feature that honour now belongs to Albert Pagara (18-0, 12) who will take a notable step up to face Indonesia's Isack Junior (22-4-2, 8) in what looks like a decent enough step up for Pagara, who many are tipping as a world champion in the making. Of course ALA are the biggest promoters in the Philippines and arguably the diamond in the rough for them is the unbeaten Mark Magsayo (4-0, 3) who will be hoping to continue his development as he battles Roy Sumugat (9-9-1, 5) in what should be a great test for the young Magsayo. Also on this card are Melvin Gumban (15-0, 7) and former Cuban amateur Reymi Castellano Aleye (3-0, 1) who was based in Cambodia though now seems to have set up base with ALA. Although this card wasn't as good as first announced it's certainly not a poor card, if anything it's still a very strong show. Whilst the card in the Philippines is still strong, the card in Japan has arguably the best Asian bout of the day as Akio Shibata (21-8-1, 9), the Asian Middleweight champion, battles the big punching Daisuke Nakagawa (22-3-2, 17), the Japanese Middleweight champion, in a much anticipated Middleweight title unification bout. It's a hard one to call this on as Shibata does hold a win over Nakagawa though with Nakagawa's power we do favour him to take home both belts here, especially after the job Ryota Murata did on Shibata on debut. Unfortunately for this show, the "522th Dynamic Glove", the rest of the card is weak with the best under-card contest being a contest between former world title challenger Makoto Fuchigami (20-8, 11) and Hikaru Nishida (9-6-1, 3). Whilst this bout is important and both fighters are ranked by both the OPBF and the JBC it's a bout we imagine will be one in favour of Fuchigami. The only other bout worth making a note of at all is the bout involving world ranked Shin Ono (16-5-2, 2). Ono, a former OPBF Light Flyweight champion, is talented though has suffered injuries in recent bouts which have curtailed his climb up the rankings. He continues his comeback by taking on the very limited Takumi Suda (10-9-2, 2) in what should be a complete mismatch in favour of the fringe world title contender. There are a total of 7 bouts on this card though we've covered the 3 notable ones, the rest really are at a low level and have next to no significance to them unfortunately. That's why we still consider the Filipino show the better one, despite the unfortunate pull out by Hernandez. This Thursday sees no boxing in Asia but it doesn't see a total lack of Asian's in boxing with a sole state side bout featuring a Kazakhstan born fighter. The one Asian fighter who is in action on Thursday is the unbeaten Dimash Niyazov (4-0-2, 3) who takes on the limited Jonathan Cuba (7-5-1, 5) in a 4 rounder. Although Niyazov is unbeaten it's hard to know how good he is due to how limited his opponents have been so far, though he did draw his last two bouts which would suggest he's far from a "hot prospect". Cuba does look to be a step up for the unbeaten man though is pretty poor himself and was stopped just 2 fights back. If Niyazov's power is as legit as looks on paper he may stop Cuba, if not this could be a very interesting match at a very low level. In the wake of "Ring of Gold" we all knew that there wasn't going to be a busy Sunday. Despite that we do actually have some fights through day with a Japanese show taking place Japan. 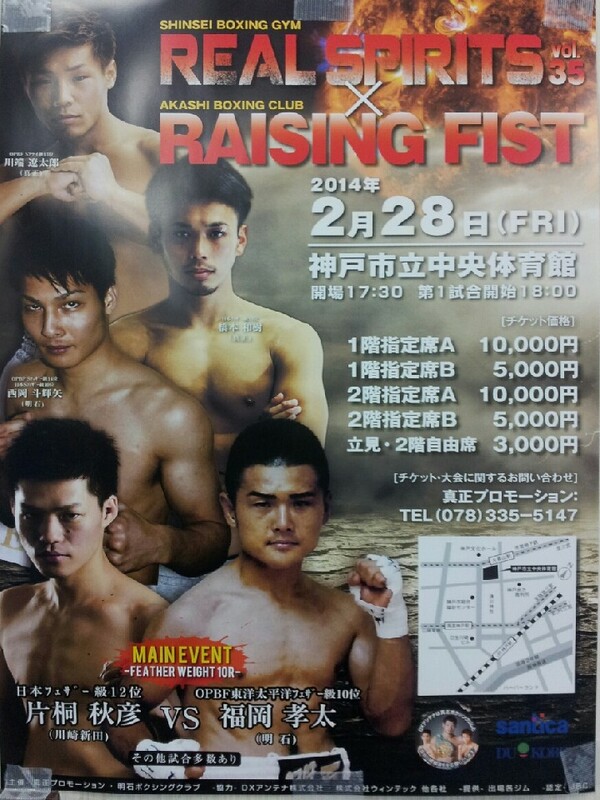 The card in question is an 8 bout show at the Akashi Municipal Industrial Exchange Center and will be promoted by VADY. The main event here is an 8 rounder between Shinichiro Morikawa (14-4-1, 9) and the once beaten Kosuke Isono (6-1-1, 1) in a bout set to be fought at a contracted 53KG limit. The limit, between Super Flyweight and Bantamweight, shouldn't be a problem for either man with both naturally fighting at Super Flyweight. Of the two men Morikawa has been in with the better competition, notably a novice Sho Ishida, though he has also lost 3 of his last 10. On the other hand Isono is on a 4 fight winning streak since losing to Kohei Yoshikawa. We've got to admit the main event is a very tough one to pick though so to is the co-feature. In this bout the once beaten Yuta Oshiro (5-1, 3) will be fighting the big punching Takahito Osaka (4-0-2, 4) over 6 rounds. Oshiro's only loss came in June 2012 to Ryuto Maruo and has since been avenged whilst Osaka is pretty limited but very powerful. This could be a potential barn burner for the lucky fans in the venue. The final we're going to note is the show's 6th contest which features the promising Daiya Shimazu (5-0, 4). Shimazu takes on his biggest so far as he climbs in to the ring against Chikashi Hayashizaki (4-4-1, 1) and whilst it looks like a mismatch on paper we do expect Hayashizaki to put up a very good fight. If Shimazu is as good as touted however then we could see Hayashizaki stopped for just the second time in his career however we do have questions about just how the unbeaten youngster really is. Action returns to Russia on Thursday with a small but yet interesting card that features one of the most interesting prospects from central Asia. The area might not get the attention that the Orient gets but it is one of the growing areas in boxing and one of the areas that seems likely to really grow into one of the big forces in world boxing. With 5 fights on the card the most interesting man to us is Kazakhstan's Welterweight prospect Roman Zhailauov (10-0, 7). Aged 19 Zhailauov is already the "interim" PABA champion at 147lbs and seems to be one of the most promising teenagers out there right now. Although he's still very young, and relatively short for a Welterweight, we would advise keeping an eye on him. Although Zhailauov has yet to have his opponent named we'd expect him to take on a limited foe as he continues to develop his very promising skill set. Zhailauov isn't the only promising unbeaten fighter on the card. Another is 27 year old Russian Cruiserweight Yury Kashinsky (1-0, 1) who battles against Elyor Gulomov (8-2-1, 7) in what looks like a very tough test. Kashinsky, if he wins, will likely be put on the fast track and we'll be really excited to follow that. Although there are 3 other contests on this card none of them are as interesting as the two we've mentioned. Although they were once a regular thing fights on Tuesday do seem an oddly bizarre occurrence now a days, especially when they include a notable fighter and are shown on television. This week however gives us one of those rarities as Thai channel 7 pick up live action from Bangkok with a potential world champion in action. The man in action is the unbeaten 22 year old Nawaphon Por Chokchai (19-0, 13), pictured, who many tip as one of the best promising young Thai's currently in action. Ranked #6 by the WBC at Flyweight Nawaphon is a man who is viewed very highly several reasons. Firstly he is the younger brother of Suriyan Sor Rungvisai, the former Super Flyweight title holder, secondly he is a gym mate of current WBC Super Flyweight champion Srisaket Sor Rungvisai and thirdly he has shown his skills in the ring numerous times. Unfortunately for Nawaphon we're not certain who he will be fighting on Tuesday. We do know that he will be putting his WBC ranking on the line and will be defending his WBC Asian Boxing Council Flyweight title for the 7th time. Hopefully it'll be a semi notable opponent who can help prepare Nawaphon for a world title fight, which we'd expect him to get in the next 24 months as long as he continues to pick up victories. Filipino fight fans are amongst the best in the world. Whether you prefer the noise crowds or respectful crowds it's hard to argue that Filipino's aren't dedicated, loyal and genuinely love their fighters. It the love of their fighters that does allow some Filipino promoters to put on some relatively poor shows of mismatches but it's also the same love that allows us to have fighters like Manny Pacquiao and Donnie Nietes. It's those same brilliant fans who will be turning out on Monday to go to the Balibago Sports Complex for the next Filipino show from Ariel Araja and the Brunsmick Boxing Promotion. As with many Filipino shows it's not packed with big names, it's not packed with known fighters but yet it does look like we've got some competitive action and the next step for a very promising youngster. The youngster in question is the unbeaten 24 year old Ernesto Saulong (13-0-1, 5). The promising Bantamweight will be looking for his first win of the new year as he takes on Mike Espanosa (12-6-1, 7) for the second time. The two men met late last year and were unfortunately involved in a technical draw after a clash of heads opened up a cut on Espanosa's eyelid. For Saulong this is about clearing up that draw, for Espanosa it's a chance for him to score a notable victory and move towards a title fight of some variety. This is the sort of bout that gets over-looked by those in the west but domestically it's a fantastic bout with a lot of meaning. The Saulong/Espanosa bout is expected to be 1 of 3 bouts scheduled for 10 rounds. Another one of those sees the 22 year old Benezer Alolod (13-5-4, 3), pictured, taking on the highly experienced Rodel Tejares (20-28-5, 5) in what looks like a good bout for Alolod at this point in his development. Although unlikely to ever be a star Alolod does hold a notable win over Rey Loreto, scored less than a year ago, and we'd hope that he can get a notable fight in either Japan or Thailand where he could collect a notable payment and a possible world ranking. Tejares is experienced though is going on a bad run with just 1 win in his last 11 contests and it'd be a genuine surprise to see him turning that around here. The remaining 10 rounder will see Desson Cag-ong (14-9, 8) fighting against Raymond Sermona (15-4-5, 8) in what looks like an excellent match up. Both have similar experience, both have a similar number of wins and both have the same number of KO's. Neither man is great or a future world champion, but both are better than their records indicate and both could move up to the OPBF level if they get proper development and management. One other bout we're interested in is the contest between the hard hitting Al Rivera (8-1, 7) and Ronald Postrano (7-18-2, 3). With Rivera having such great power it's hard to avoid him and he's certainly got the potential to be very exciting to follow. Unfortunately however Rivera does already hold a stoppage victory over Postrano. As well as the 4 bouts mentioned there are 2 others expected to be on the card, both of which look very competitive.